Stylish Metal-Free safety trainer with composite toe and midsole protection. Breathable terylene mesh upper with glossy zig-zag synthetic trims and perforated stylish grey microfibre overlays. Comfortably lined with industrial textile mesh lining and padded collar and tongue. Protective heel and toe guards. Heat- resilient rubber sole with SRC slip-resistance qualities and energy absorbing heel.Compliant to EN ISO 20345 S1 and SRC Slip resistance. Black action leather upper and a subtle padded ankle collar are suitable for men and women at work and are available in full sizes 3 to 13. With an range of safety features that include a lightweight protective composite toe cap. Features an antistatic sole unit, Energy absorbing heel. Slip resistant sole. Safety FS19 Ladies Safety Shoes are practical and comfortable. They feature a wax leather upper and soft PU/rubber sole. Textile lining for soft comfort against your feet. Open access for feet to slip on and off which makes these slippers very easy to use. Toe protection up to 200 joules of force. Ideal for light industrial use. Lightweight and breathable non-metallic safety trainer with seamless perforated upper and highly abrasive resistant dual density PU outsole. 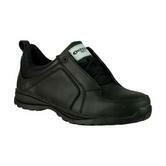 Safety Trainers with 200 Joules composite toe cap and Non-metallic, anti-penetration midsole. Lightweight, metal free, waterproof low-cut safety hiker. 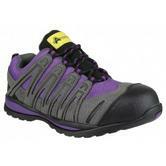 Ladies Safety Trainer made with a rugged water-resistant action leather and breathable mesh upper. More comfort provides internal waterproof membrane with moisture wicking mesh lining. Cushioning comfort memory foam footbed moulds to the shape of the foot for unique fitting. Lightweight 200J composite toe cap Amblers Safety AS708 shoes, with scuff guard overlay. Composite midsole gives underfoot protection, more comfort and hardwearing with antistatic EVA/Rubber sole with energy absorbing heel that is heat resistant to 300 degrees. From the Amblers Ladies' Safety range of footwear the FS121C incorporates midsole protection, composite cap, and smooth mono-black action leather upper with horizontal mid-eyelet overlay. The padded collar with mesh lining provide great protection. The polyurethane sole with energy absorbing heel provides great slip-resistant. Amblers FS662 Slip On Safety Shoes are specifically crafted for the electronic components assembly and manufacturing industries. They are primarily designed to disperse the amount of static electricity on your body and conform to EN 61340-5-1 standards. This style of shoe was an original safety shoe - the PVC cushion sole makes for great walking comfort and ideal for industrial office use. Classic gibson-style shoes crafted with a smooth mono-black leather upper gives a more formal look. 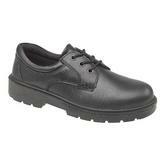 Safety shoes comes with full 200 joules protection in the steel toe cap. 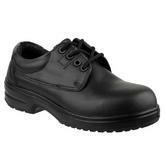 Amblers FS237 Classic Safety Shoe conforms to EN ISO20345 SB SRA Safety Footwear Standards. Amblers FS65 Executive Black S1 Safety Shoe are made from high quality materials these boots comply with the highest of safety standards. They incorporate steel toe protection for added safety. Ankle supports for added protection and comfort. Stylish and comfortable these shoes are ideal for any situation. These shoes are manufactured from high quality leather and has a soft leather sole for excellent comfort and ease of use. Ergonomically designed to offer hygiene, traction, safety and prolonged standing footwear solutions. Machine washable at 30°c to ensure stringent clinical and food industry hygiene standards. Easy to wipe clean to prevent cross-contamination. Can be considered in the same way as any cloth in order to plan periodical washing. AEGIS Microbe Shield® provides protection against odour/staining/deterioration caused by bacteria, fungus and other micro-organisms. The sole gives a high-level of slip resistance essential where slips from spillages is a real risk. Resistant to various low concentraction acids, oils, animal plant oils and fats, blood, disinfectants and cleaning chemicals. The soles also feature an energy absorbing heel, reducing the impact on joints throughout day-to-day work. Lightweight metal free toe cap. The wide and roomy toe box area allows feet to maintain a natural position during work. Comfort fitted with a thick anti-bacterial insole. 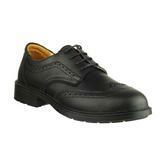 This smooth leather upper brogue shoe makes an ideal choice for uniform or office use. It features a dual density PU sole, making it comfortable to wear whilst providing excellent slip resistance combined with durability. Amblers FS62C are a smart and stylish Gibson shoe ideal for employees who may at times be walking or working in wet weather conditions. Steel toe caps and composite midsoles give excellent protection, and a dual density PU sole offers great slip resistance. These shoes are finished in a smooth waterproof leather. Ladies metal free safety trainer. Compression and Impact resistant composite toe cap and composite midsole for underfoot protection. Outsole resistant to high heat of 300°c. Perforated fashionable grey microfibre overlays. Heel guards and protective toe. Padded tongue and collar for further support and comfort. Soft lattice lining, fabric loop-lacing system and rear pull-on loop. SRC Tested on a ceramic tile contamination with a dilute soap solution Tested on flat steel contamination with glycerol. 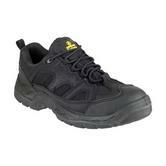 The Amblers FS47 safety trainer offer excellent toe and midsole protection. A textile mesh lining guarantee a comfortable fit, while the padded collar and tongue give additional support. Underneath has a grooved, slip and heat resistant rubber sole, while the front toe has a protective bumper. 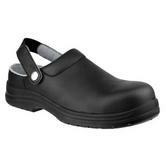 Amblers FS47 Womens S1 Ladies Safety Trainer conforms to: EN 20345 S1 P SRA safety footwear standards. These Lightweight and super comfortable Ambler shoes are ideal for those tasks that require that extra dexterity, the 702 is just one of the many safety shoes we have to offer. 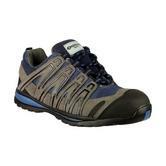 Designed from lightweight breathable under mesh these shoes provide maximum comfort whilst also providing the user with maximum protection. All of the shoes in this category have been manufactured with protective toe caps to ensure the users safety whilst at work, some shoes like the FS68C have been designed with composite metal free toe caps.